At Charlotte Motor Speedway in 2016 Martin Truex Jr. led all but 8 of the 400 laps. There were some who reasoned that Truex would never have to work harder to win then he did that night when he had to stay up on the wheel for near 400 laps. Turns it they were wrong. 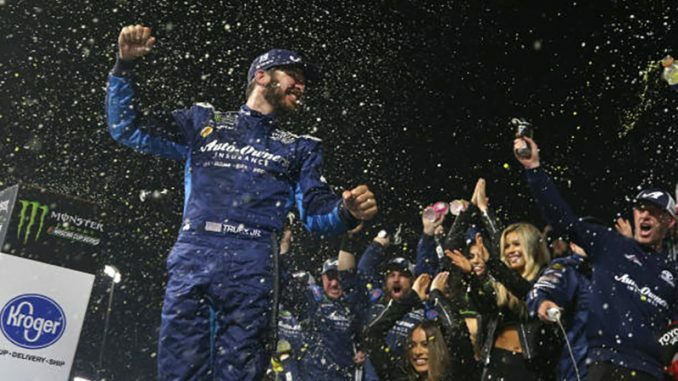 Truex staged perhaps the drive of his career Saturday night as he had to hold off first Clint Bowyer then Joey Logano in the closing laps to win the Monster Energy NASCAR Cup Series Toyota Owners 400 at Richmond Raceway. 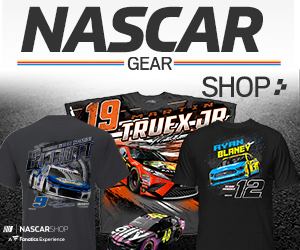 It was his first win of 2019, his first with Joe Gibbs Racing, and his first in 25 races dating back to Kentucky last July. Most importantly it was his first win on a short track in 81 starts. Truex led a race high 186 laps, most of those coming in the second half of the race. He took the lead for the final time after a round of green flag stops that started on lap 219. In the closing laps he saw a lead of 2 seconds slowly evaporate as Bowyer reeled him in. Over the last 40 laps Truex got up on the wheel forcing Bowyer to try and pass him on the inside, which was not the preferred line. Bowyer wore his tires out allowing Logano to get by for second. Logano, who had won stage 2, was soon looking for the lead, but after the battle with Bowyer Truex had stretched his lead out. Logano was able to get close in the final 10 laps bringing Bowyer and Kevin Harvick with him, but Truex was able to protect that faster outside line and hold on for the win. Denny Hamlin, who was one of 8 cars forced to start at the rear of the field after failing pre-race inspection finished fifth. Early in the race it looked like it would be another Kyle Busch show. He took the lead from polesitter Kevin Harvick and went on to win the first stage and lead 101 laps. His undoing however came during pit stops during the races 4 of 6 cautions. During the stops Busch was penalized for speeding and restarted 26th. He was never able to get back to the front and finished eighth. In addition to Hamlin, others having to give up their qualifying spots included Jimmie Johnson, Daniel Suarez, Eric Jones and Aric Almirola. Hamlin was the only driver able to make it into the top 10. Austin Dillon, and Brad Keselowski were sixth and seventh in front of Busch; Ryan Newman and Paul Menard rounded out the top 10. For Truex the final laps Saturday night were admittedly the toughest of his racing career. The Monster Energy NASCAR Cup Series takes its first weekend off of the season before heading to Talladega Superspeedway on April 28.